You are here: Virgin Islands News Online » News » Anegadian Vernon V. Vanterpool joins Ninth District race! Mr Vanterpool has joined the historically long list of persons contesting for the Ninth District seat to be vacated by Hon Ralph T. O’Neal OBE who served that district for some 40 years. "I am the winner with an absolute certainty. The Ninth District seat belongs to Vernon Vanterpool, on election day vote for the crown, that's my symbol. There is no other way. 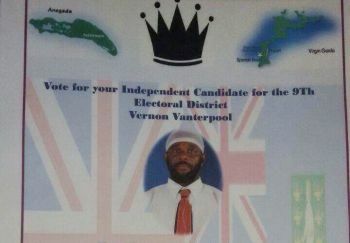 You have tried the rest now try the best," said a confident Vanterpool who will be contesting as an Independent candidate. 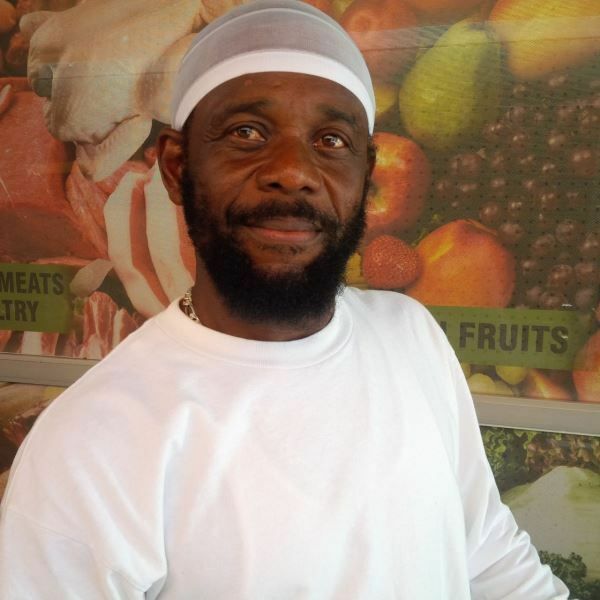 In an interview earlier today May 15, 2015 with Virgin Islands News Online, Mr Vanterpool, a resident of the sister island of Anegada, said he is in the race to make a difference. "The difference will come with accountability, fairness, fair share for all, and some of my main issues will be health, education, land in particular for the young people, homes and businesses." According to Vanterpool, with the way things are going presently, the country is being developed and the citizens are being left behind. "I intend to take us forward while our country grows." Mr Vanterpool joins the National Democratic Party’s Dr Hubert O’Neal, Mr Elton L. Sprauve of the Virgin Islands Party (VIP), Faye J. Reese-Charles of the People’s Empowerment Party and Independent candidates Dr Rawle R. Hannibal, Mr Albert O. Wheatley and Mrs Stephanie I. Faulkner-Williams among the list of persons contesting the Ninth District seat. Well your post has me on the ground with laughter! Absolutely funny. I really needed that belly laugh. My brother we speakever so often and I applaud you on this bold and courageous move. We know that Anegada has always been treated as an unwanted step child and treated quite unfairly. SO to all the ha ha has and the he he hes lets just tell them ( Who fells it knows it ). They laughed at Noah , They laughed at David , so if this is your passion persue it. Iknow you are not aboutN.D.P. or V.I. P. or about self. You are about country. FORWARD BROTHER. holy cow, where is all these so called new politicians appearing on the scene from? Now look at this dude appearance. Tell me where in Caricom region would he go represent the BVI with that head tie up? Much less to go discuss climate change and other important issues in the UK..just sad..............Its disgusting! This election has to be the comic of the century! It doesn't make sense to get angry anymore when they surface. Look jokes in the 9th and 2nd. Strupes this must be a joke. do you think that if the country is "being developed and the people are being left behind", that the NDP will listen to you? can change that attitude? your people-based platform speaks more of VIP than NDP. You and your social agenda will be ignored. This is too funny. He need to go and sit down. LORD HAVE MERCY WA NEXT WE GOING TO SOON NEED A PRIMARY ELECTION HERE IN THIS COUNTRY,. The amount of candidates coming forward...what does this tell the electorate?????!!!!!! The people are FED UP WITH THE NDP. The NDP priorities are in the wrong order!!!! Not really. This is only the case in the 9th. And this is because a 40 year veteran has left the scene. Now everybody under him feels emboldened. Mayson if a few islandman was allowed to run you run too. Yo is one ah we. This is our country'''dog and cat running so run! Politics have taken a toll on the 2nd and 9th districts LORD have mercy on the VI. Many will be called but only All Out will be chosen. Country being developed without the people a legitimate concern/platform though. Proof is in the pudding. Wait until nomination day to see how many of these cuckoos actually sign up! Mr. Banter pool stop wasting people time. A evade is a beautiful place with beautiful people...please stop making us so ashame! Go pull fish pot or sit down! I want to get my hands on some of this goverment money thats sharing bcuz everyone and their grandmother want to run for office. What they heard about? He got 1000 to waste. Best he give it to the Hospital or Red Cross. I commend Mr. Vanterpool for his vision. It's about time someone from Anegada comes forward as a voice for the people of the 9th. The district is in need of genuine leadership. I hope he is successful. Now if he was running or voting for the NDP he would've been God"s son? at heart. Please learn that those who are laughing will laugh more wben your plans are accomplished. It has been more than 40 years since an Anegadian threw his or her hat in the ring and now is the time. We need more Anegiadian youths to step up and represent the ninth district. Congrats Vernon!! This is a step in the right direction. When T. H Faulkner stepped up he made a difference so I am encouraging more of the youths to step up and make a diference.